Civil Engineering Department Associate Professors Dr. Jonathan R. Dungca and Dr. Mary Ann Q. Adajar, Academic Service Faculty Engr. 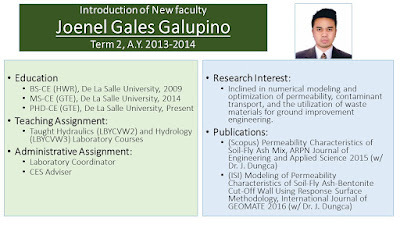 Joenel G. Galupino and Engr. 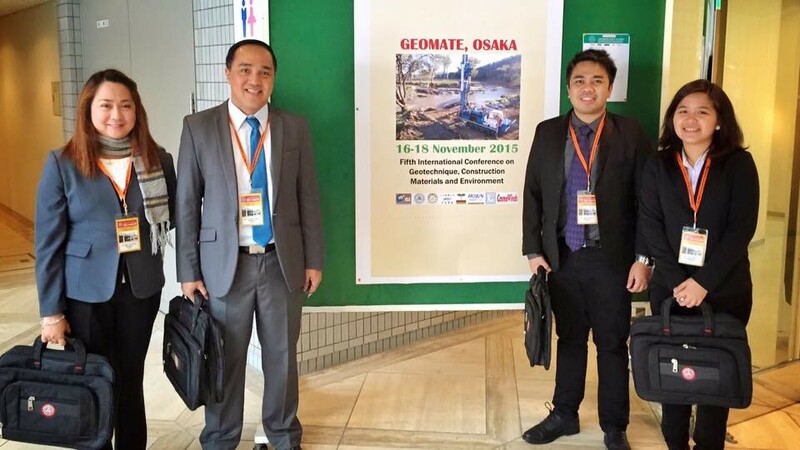 Erica Elice S. Uy, PhD student, went to the GEOMATE 2015 conference to present their respective researches. DLSU delegates at Osaka International House Foundation, Osaka, Japan. 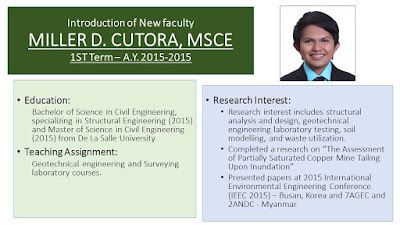 Dr. Jonathan R. Dungca was the session chair for the Technical Session 2 which was held on Nov. 17, 2015. 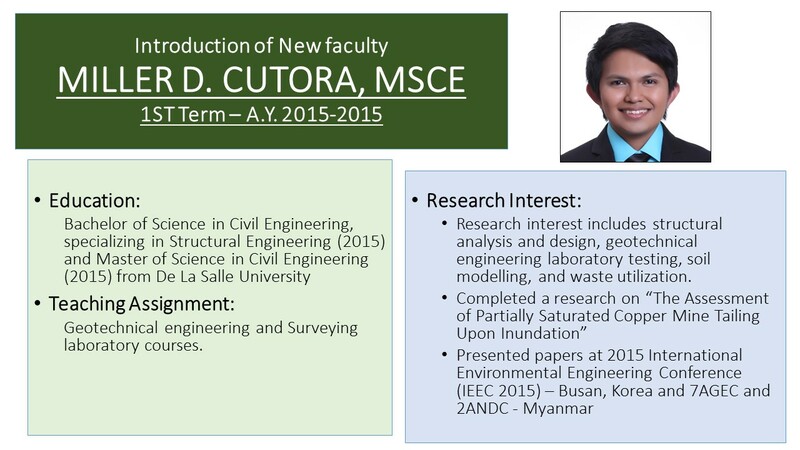 All their submitted papers were published in the International Journal of Geomate (ISI/Scopus-Indexed). 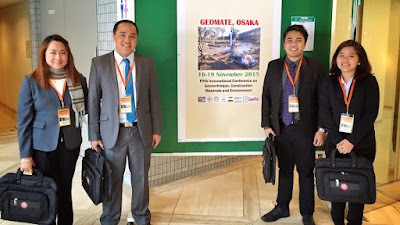 GEOMATE International Society in coordination with Kansai University, Japan Geotechnical Society, AOI-Engineering, Useful Plant Spread Society, HOJUN and Glorious International organized The Fifth International Conference on Geotechnique, Construction Materials and Environment, GEOMATE 2015, last November 16 to 18, 2015 at Osaka International House Foundation, Osaka, Japan. Geoengineering, construction materials, environmental issues, water resources, earthquake and tsunami disasters were some of the topics discussed during the parallel sessions. The conference was also dedicated to the Tohoku-Kanto earthquake victims that happened on March 11, 2011. Engr. 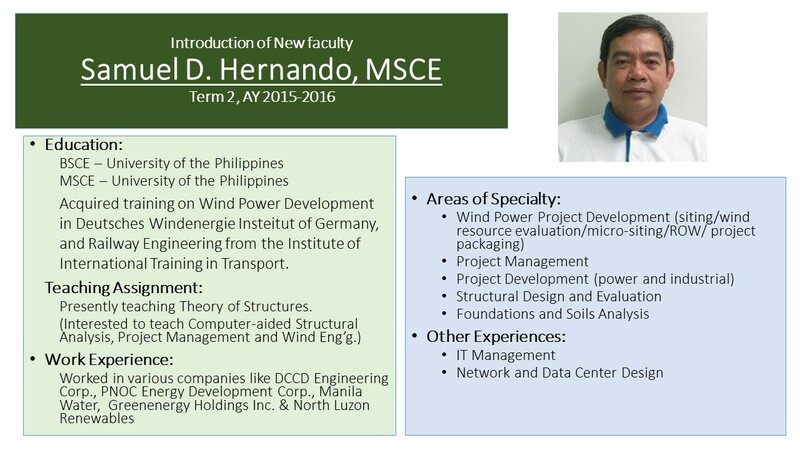 Samuel Hernando, a licensed civil engineer who has vast experience on wind power development having worked for many years at the PNOC Energy Development Corp. is now a part-time faculty member of the DLSU CE Department. His first assignment is to teach Theory of Structures to 3rd year undergraduate students. 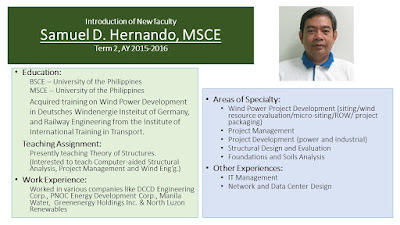 He will soon be assigned other structural engg and construction management courses in the undergraduate and graduate courses. 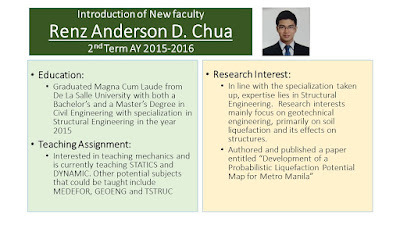 DLSU CIV alumnus , Engr. 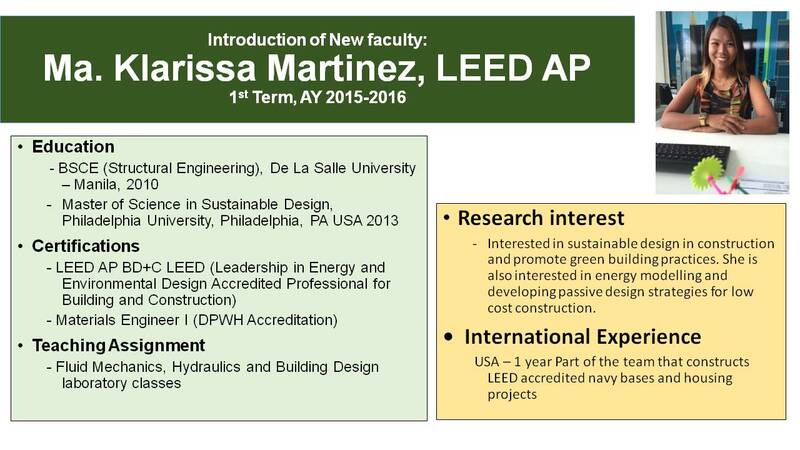 Klarissa Martinez, a LEED and DPWH Materials Engineer accredited professional joins the CE Department as a part-time faculty teaching Building Design and Hydraulics Lab courses. 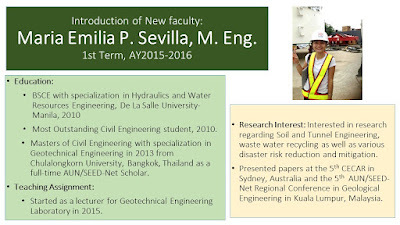 She will be an asset to the department especially now that Sustainability and Green Engineering concepts are starting to be included in some of the undergraduate and graduate courses. 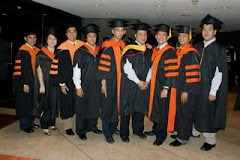 Joenel Galupino graduated BSCE and was recognized for his Outstanding Contribution to the CE Department in 2009. And he still continues his dedicated service to the university and the CE students and faculty by serving as an Academic Service Faculty (ASF) in-charge of the laboratories of the CE Department starting 2013. Meet our humble and energetic laboratory coordinator. 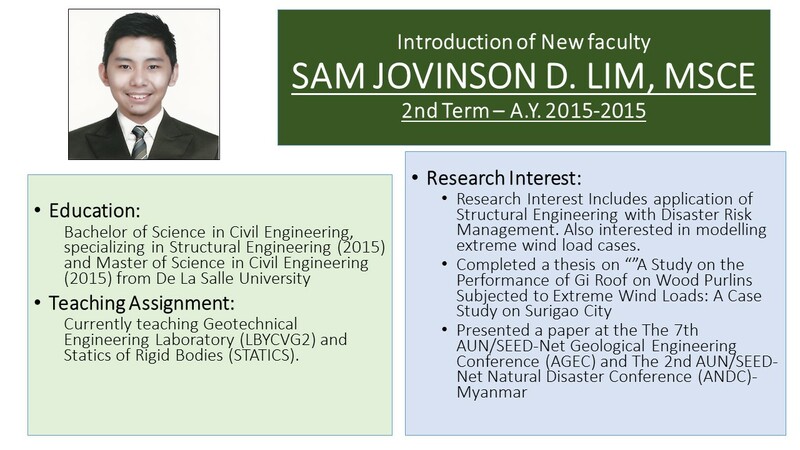 AUN/SEED-Net scholars who graduated Master of Engineering from Chulalongkorn University returned to the Philippines and many of them applied for a part-time teaching position at the CE Department. 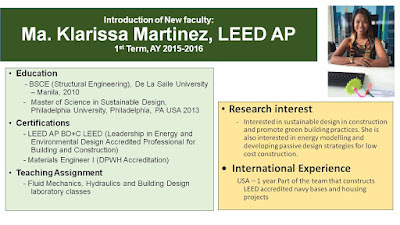 In 2014, three alumni - Daniel Valerio, Erica Uy and Jamiel Jayme started teaching at DLSU. Valerio and Jayme are still teaching part-time while Uy is now a full-time ERDT scholar taking PhD-CE at DLSU. 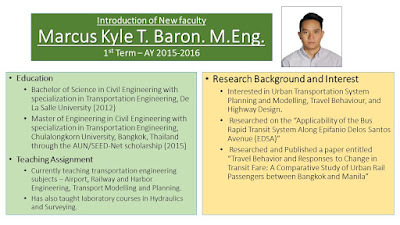 Last 2015, two more alumni - Maria Emilia Sevilla and Marcus Kyle Baron also started teaching at CE Dept. 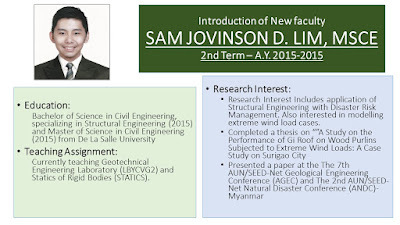 Here is an introduction of the two alumni and former scholars. The BSMS honors program is a ladderized program at DLSU for students with outstanding academic performance. These BSMS students also qualified in the DOST ERDT scholarships. 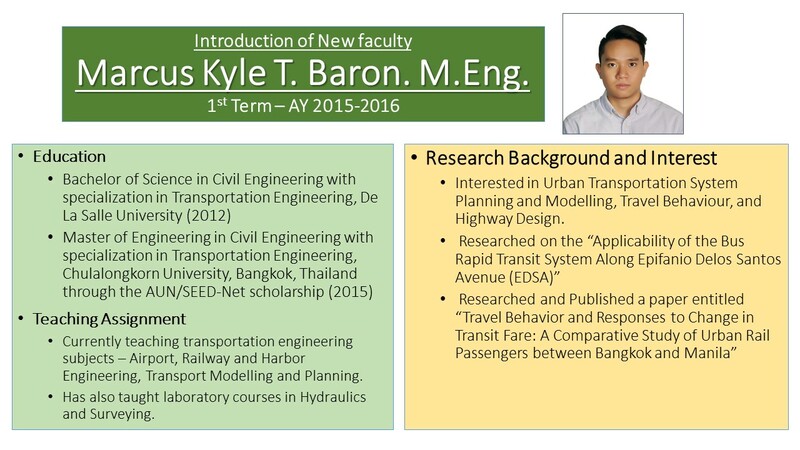 The most recent graduates of this program who also just passed successfully the CE Board Exams last November 2015 were enticed to teach as part-time faculty of the Department of Civil Engineering. Here is an introduction of the new part-time BSMS faculty who hopefully will fill-up the next generation (4th generation - referred to as the GLOBALIZERS) of faculty members of the department. 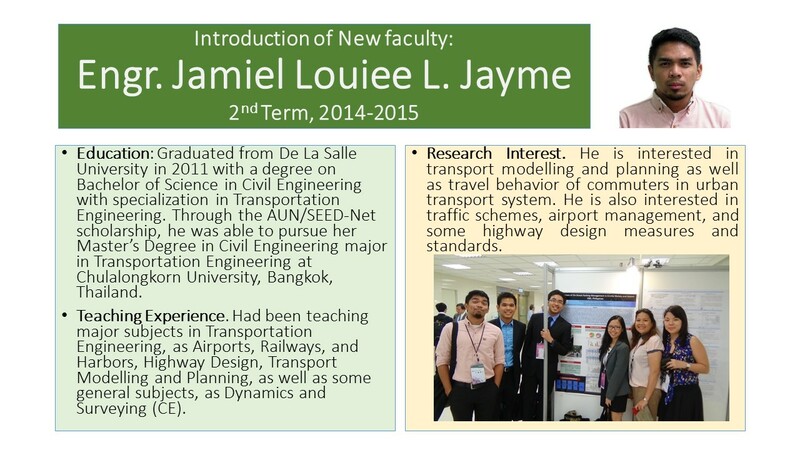 Engr.Jamiel Louiee Jayme, DLSU BSCE(TRE) alumnus and AUN/SEED-Net scholar at Chulalongkorn University joins the Transportation Engineering Division as part-time faculty and teaches the specialized courses in TRE.. 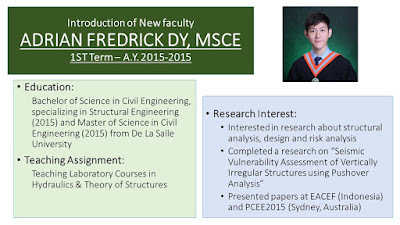 He is an advisee of Dr. Alexis Fillone in the undergrad thesis. 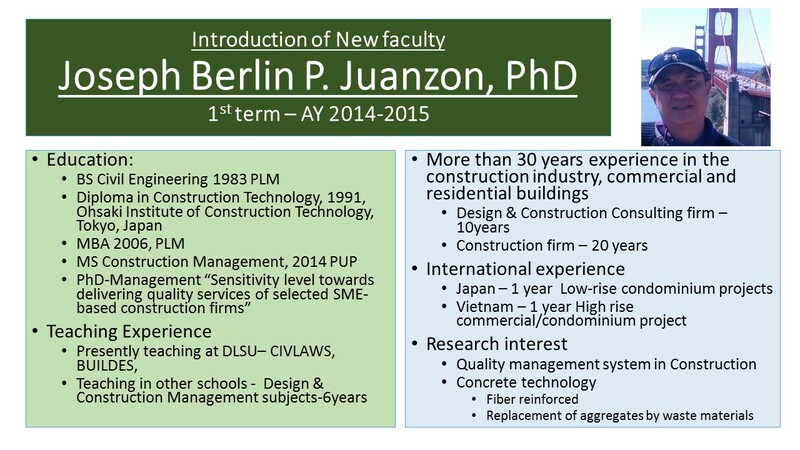 The Construction Technology and Management (CTM) Division has a new part-time faculy with a PhD in Management, Dr. Joesph Berlin P. Juanzon. 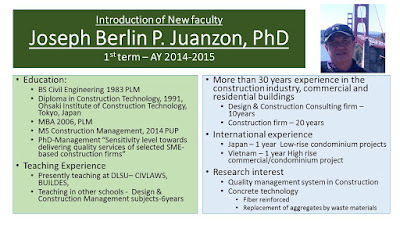 Dr. Juanzon has more than 30 years experience in the construction industry. He started teaching at DLSU last 1st Term AY 2014-2015. He is teaching courses on CIVLAWS and BUILDES. 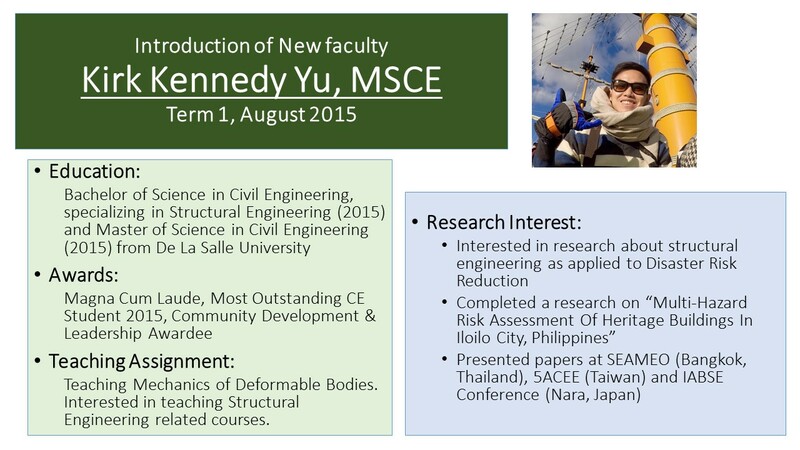 The Civil Engineering Society (CES) has organized various seminars to enhance and compliment the Lasallian education of civil engineering students, This Feb. 12, 2016, two seminars are scheduled. These seminars have been tagged as alternative classes or 4th hour activities by some faculty members. 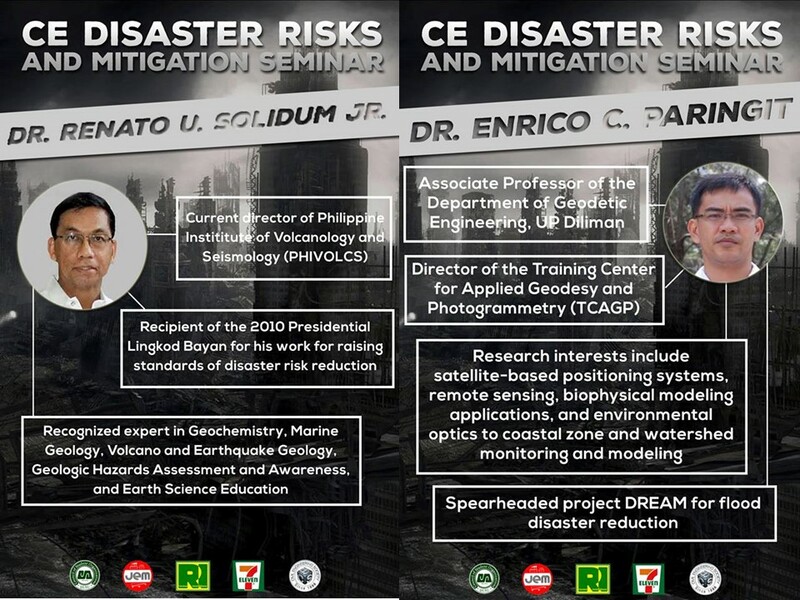 Incentives in several classes will be given for attending these seminars. The Philippines is known for its numerous natural disasters and their devastating effects to people and property. 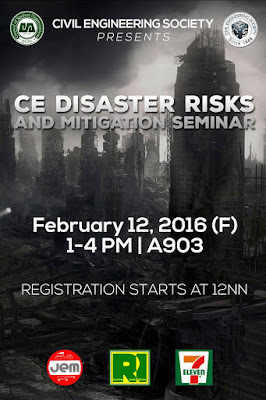 As future civil engineers, what can you do to avoid further loss brought about by catastrophes. 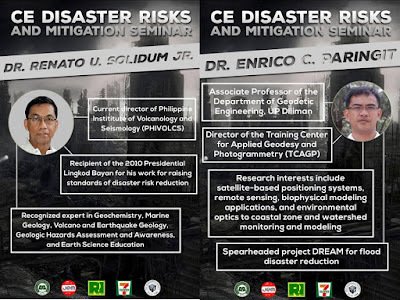 Listen to resource speakers Dr. Renato U. Solidum Jr. and Dr. Enrico C. Paringit as they share their knowledge on disasters and their mitigation.Happening this February 12, 2016 at the Brother Andrew Gonzalez Hall Rm 903 (A903) from 1 to 4 pm, Civil Engineering Society presents the CE Disaster Risks and Mitigation Seminar. Do you want to help the society but have no chance in college? Do you want to live the Lasallian virtue of being in service for others especially the less fortunate? Are you bored from the lectures and lessons and want to explore your learnings outside the four corners of the classroom? 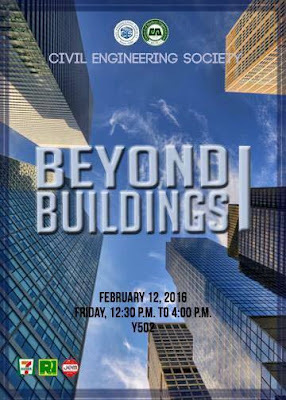 Worry no more as Civil Engineering Society presents BEYOND BUILDINGS 1. Come by at Y502 from 1230PM-4PM this Friday and let this seminar embody the future Lasallian civil engineer in you. In celebration of Math Awareness Month, St. Paul College Pasig invited Dr. Garciano of the Civil Engineering Department to give a talk on Mathematics to a class of 10th Graders. 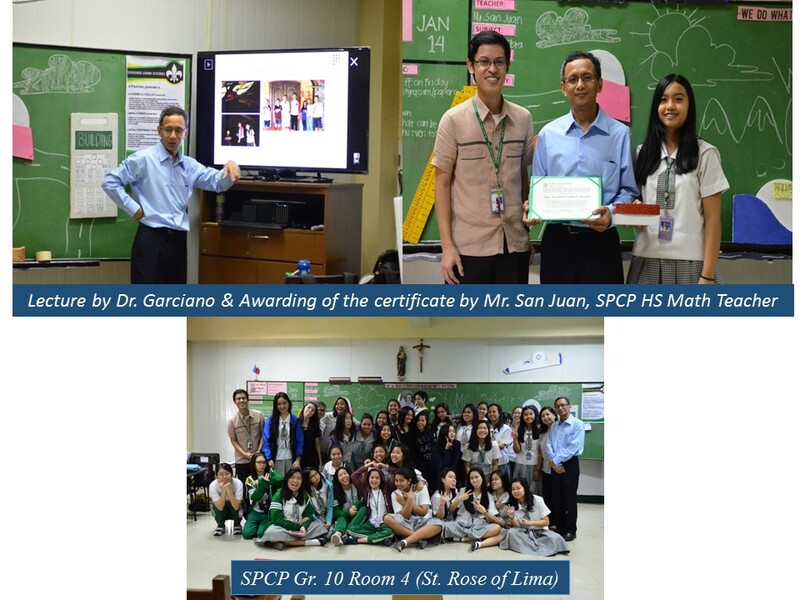 During the talk, Dr. Garciano shared to the students, how math is used in everyday life, how it helped him in his career and how it can be a tool to solve “out-of-the box” real life problems. 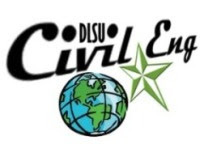 This talk was also a golden opportunity to introduce to “our future Civil Engineering students” the Civil Engineering program of DLSU and its four (4) specializations. 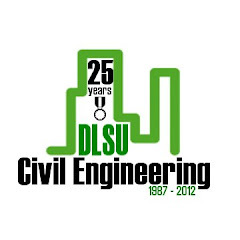 He also mentioned that DLSU has produced top notch Civil Engineers and who knows the next one might be from this class.